My colleague Timothy Reuter (of AidDroids fame) kindly invited me to co-organize the Drone/UAV Search and Rescue Challenge for the DC Drone User Group. The challenge will take place on May 17th near Marshall in Virginia. The rules for the competition are based on the highly successful Search/Rescue challenge organized by my new colleague Chad with the North Texas Drone User Group. We’ll pretend that a person has gone missing by scattering (over a wide area) various clues such as pieces of clothing & personal affects. Competitors will use their UAVs to collect imagery of the area and will have 45 minutes after flying to analyze the imagery for clues. The full set of rules for our challenge are listed here but may change slightly as we get closer to the event. I want to try something new with this challenge. While previous competitions have focused exclusively on the use of drones/UAVs for the “Search” component of the challenge, I want to introduce the option of also engaging in the “Rescue” part. How? 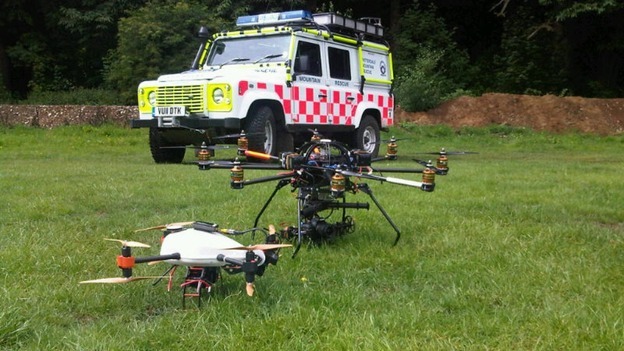 If UAVs identify a missing person, then why not provide that person with immediate assistance while waiting for the Search and Rescue team to arrive on site? The UAV could drop a small and light-weight first aid kit, or small water bottle, or even a small walkie talkie. Enter my new colleague Euan Ramsay who has been working on a UAV payloader solution for Search and Rescue; see the video demo below. Euan, who is based in Switzerland, has very kindly offered to share several payloader units for our UAV challenge. So I’ll be meeting up with him next month to take the units back to DC for the competition. Another area I’d like to explore for this challenge is the use of crowdsourcing to analyze the aerial imagery & video footage. As noted here, the University of Central Lancashire used crowdsourcing in their UAV Search and Rescue pilot project last summer. This innovative “crowdsearching” approach is also being used to look for Malaysia Flight 370 that went missing several weeks ago. I’d really like to have this crowdsourcing element be an option for the DC Search & Rescue challenge. My team and I at QCRI have developed a platform called MicroMappers, which can easily be used to crowdsource the analysis of UAV pictures and videos. 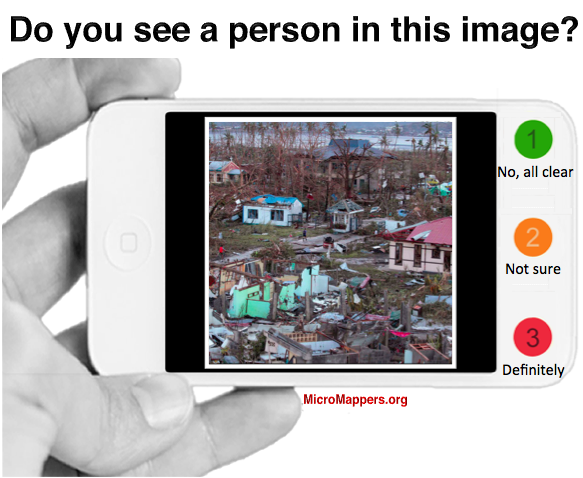 The United Nations (OCHA) used MicroMappers in response to Typhoon Yolanda last year to crowdsource the tagging pictures posted on Twitter. Since then we’ve added video tagging capability. So one scenario for the UAV challenge would be for competitors to upload their imagery/videos to MicroMappers and have digital volunteers look through this content for clues of our fake missing person. In any event, I’m excited to be collaborating with Timothy on this challenge and will be share updates on iRevolution on how all this pans out. This entry was posted in Crowdsourcing, Drones/UAVs, Humanitarian Technologies and tagged Challenge, MicroMappers, Rescue, Search. Bookmark the permalink. Goodrich, M.A., Morse, B.S., Gerhardt, D., Cooper, J.L., Quigley, M., Adams, J.A., and Humphrey, C., (2008), Supporting Wilderness Search and Rescue using a Camera-Equipped Mini UAV, Journal of Field Robotics 25(1), 89–110 (2008). There has been some work done in relation to dropping flotation devices to people in the water, so I think using UAVs to deliver some immediate resource to a lost person is certain of value and very realistic with todays technology. Further work in relation to cargo UAVs will certainly expand our knowledge and understanding in this respect over the next few years. Many thanks for your guidance, Ged, I really appreciate it. I’ll be sure to read the piece by Goodrich et al., thanks for sharing. Yes, coordination is certainly a challenge. The ability to easily & quickly share flight plans (and subsequent changes) is important. This is in part the motivation behind the Humanitarian UAV Network (UAViators). In terms of collisions, we’ll be seeing a lot more in the near future on automated collision avoidance systems for UAVs, just like those that exist on manned aircraft. On cargo UAVs, I agree, they will be an interesting development. Sounds really cool. However a small suggestion for the future. I work at a college and would love to get students involved but May is a terrible month between finals and graduation. Any chance for more events in March/April? Love the work u all are doing. Thanks Jim, there’ll be another challenge in Dallas mid-September. But I’m not aware of any others in the US before then. Thanks Patrick! Any in Canada that you know about (we can probably get a group to travel north if need be.